I have questions about the break up bottle spell. 1. Does it contain dog and cat hair? 2. if not then what does it contain? 3. as this spell worked for couples who have been together for over 6 months or do you recommend something else for the long term couples? Hi I want to order a break up spell kit....but I was wondering what should I use for the candle. Here i see a women and guy side by side. The people im doing iton is together but there not married. So does this kit come with a different candle? And yes, you can use it for long term couples. it doesn't matter if they are not married. Thank you Miss Aida you are helpful in many ways. im buying lucky mojo products to actually do the work. I love lucky mojo and feel its powerful and I love you guys! 1. What would be defined as a crossroad? If you are trying to divide something loose like self-lighting incense, just divide it into seven equal piles. You can put each pile in a plastic baggie while you wait to use it. To divide a candle, you can scratch notches into it so it's divided into seven more or less equal sections. Hope that helps. 1. When working out the spell, when do you fill up the bottle? Do you do it during the spell when you first start it and shake it up? or do you fill it up at the end of the 7 days. How do you wrap the incense into a cone? How long does it take before it starts to manifest? That is the age old question that nobody knows the answer to! Sometimes they can work right away, sometimes they can take months upon months, sometimes they may not work. In regards to the name paper, how do I symbolically write the names on two pieces of paper? If you're working the Break Up spell kit, which I'm assuming you are since you posted under its subforum, the spell kit will include instructions that you can follow and should tell you how to write the name paper. 1. For the bath, Do you take it after you finish the 7 days? 2. Can you put up the devil strings and pods right away? The answer to your first question is yes, the answer to your second question is to wait until you finish your spell. That would be my preference. So I will be doing a reconciliation spell but first id like to do a break up spell. He says he does not have a gf but is "seeing" someone, aka sleeping with someone. I know that he is seeing someone else and I have an idea of who it is BUT I am not completely sure. Is there something I can do although I am not sure of the girls identity? You don't have to know the girl's name to do a break up spell on them. When you create the name paper, just call her something general like The Other Woman or The Love Rival. I attempted the break up spell kit on a couple almost a year ago but it was my first ever spell, I messed a lot of things up and it never manifested. Now I want to try again. However, things have intensified since then. I've had readings which have shown the girlfriend has spells on just about everyone - a binding spell on him, some kind of sweetening/influence stuff on his family, and is now cursing me too. I've ordered uncrossing supplies for both him and I but they haven't yet arrived. I want to get something done asap but due to work and school commitments, it's really hard to find an entire week where I can guarantee being able to continue regularly working the spell. I just broke up from school for the holidays so this month is my best bet for getting as much work done as possible. Tomorrow is the last saturday where I could start the spell kit and still complete it during the waning moon. However, he and I are clearly still under crossed conditions. My health is suffering and he is bound in this really unhealthy relationship. Is there any point doing the break up spell kit before Uncrossing? Or would I do better to wait for the Uncrossing stuff to arrive and then do the break up spell afterwards, even if that means doing it during the wrong moon phase? I know there's not necessarily a right or wrong answer to this, just wanted people's opinions! Thanks! Do regular onions work to break up? Also how about hot peppers? What foods (other than the oils) work on these break up spells? Or must I use the oils? what was MOST effective to everyone? People deploy many things to uncross. We use oils to dress candles and to add to some of the products we are using. The oils and powders are very traditional to the work. MOST effective, is a subjective to the worker because someone like an AIRR worker may use a pepper and a candle and break them up, others will use the entire spell kit. Some general items include: cat and dog hair, red pepper, black pepper, poppy seed, alum, lemon, limes, water from a bad storm, sharp objects like : needles, pins, broken glass, razors. You do not need to work the oils, but why would you not use traditional products made by the tradition in your work to support the work? So true. Thank you j82. I didn't know there was a spell kit. Is there a link to that? 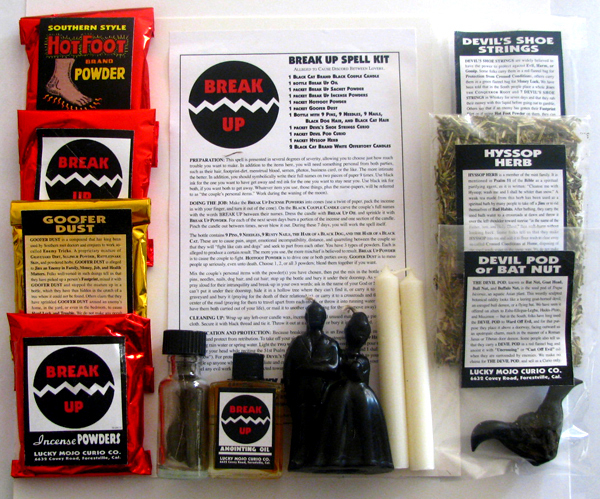 This Break Up SPELL KIT is not the same item as a Painted Break Up BOTTLE SPELL. The latter has its own thread, as do all of the Painted Bottle Spells. Can I use this Break Up Spell if I don't know who the female is? Also can I do it on all the females this guy will ever meet up except me? If so, for either or both questions, how would you address the dolls? You can use the spell kit for an unknown female, word it as all romantic rivals. Of course if you find out the name use it though. It would be ongoing work to stop all women ever in his life. Thanks. Are there services to do this for me on luckymojo? And I certainly don't have their personal items especially that personal. And I don't have access to put it in the place where they can step over the kit. Is there something simpler and can be done more discretely and/or in my personal space without disturbing the people I'm doing this on? LMAO about the urine sample!!! But all of the info you're seeking is in the freezer spell thread. A side note about ice though, is that for a larger volume of water (like a jar for example), it needs to be much colder than your freezer to freeze completely clear. Otherwise, it'll be crystallized and sort of an ice/frost thing and it won't be very easy to make out what's frozen inside it. Although the foil suggestion solves it either way. Also, once it's frozen, no one can get to the petition paper anyway because it's frozen solid in a block of ice. I share a freezer too, and I just put a label on the outside of the jar with my name on it. No one has ever asked me about it and I have 3 in there. Is it possible just so it in the woods ? Is it possible to do what in the woods? Forgive my grammar but I meant , the whole kit can be achieve in the forest? Also in regards to carving names, is it fine if the first name is just two initials like JD? Yes, you can perform a Break Up Spell Kit in the woods. There are in fact special spells that are only worked in the woods, although this is not one of them. She has been putting an audio recorder in his car for a year. It looks like a flash drive. He finally discovered it. And he gave it to me to hold for him so that she couldn’t get to it. Could I use this as a personal item of his, or a personal item of hers, or am I able to use this at all? A short background for why I am doing this. She knows all about me, he has told her that he doesn’t love her anymore and that he is extremely in love with me. Their entire marriage has been toxic and negative but he is too weak to leave and divorce. She is so controlling and manipulative. She makes a ton more money than him, but he pays all the bills and he stays stressed while she sits on money and doesn’t help him. She uses him. One week he was convinced to stop talking to me. (A month ago). He thought that was best in order to try to “work” on his toxic marriage. That week that he didn’t talk to me, he literally mourned about letting me go. He mourned so bad that he did it right in her face. She so called “consoled” him through it, the entire time, she made sure that she told him that I hate him so much and to never ever contact me again. He was crying in her arms, over me. (I kid you not. And when she and I ran into each other the following week, she confirmed that, while trying to go off on me because she saw him and me at an event. Yep, he was with me the following week after he cut me off. And he told her to her face days before that he had wanted to see me. She claimed that she was ok with that. But exploded when she saw me because she realized that she had lost that temporary control that he had given her over our relationship) But during that week that he was not speaking to me, she tricked him into believing that she was being caring about his feelings, when really all she was doing was taking control of his emotions and the situation between him and me, and trying to get him to stay away from me forever. That only lasted 5 days before he contacted me begging me to take him back. She is very emotionally and verbally abusive. You could use the note as a sample of her handwriting, but I'm not sure how you would use the audio recorder. Wishing you the best of luck with your work. 1) What effect would it have if the break up spell is used on people who aren’t really romantically involved? 2) What if I suspect that they’re together, but in fact they aren’t? 3) What if I don’t know the last name of the enemy? 1) Break Up spell kits can be used on friends, business associates, cliques, or political alliances. They are not limited to romantic situations. 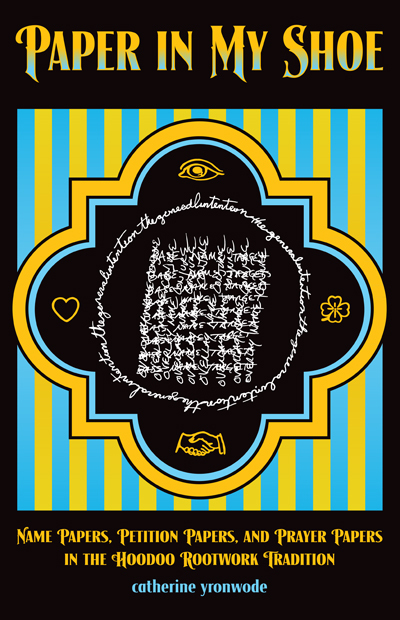 2) If two people are not together or connected in any way, then the Break Up spell kit will have no effect on their (non) connection. 3) Use whatever name and description you have. This is fully covered in my book "Paper In My Shoe," a helpful and inexpensive guide to names and name-papers that will be of use to you as you continue to work in this tradition. Is the candle a black male and female figure side by side? that is used for breaking up or divorcing couples, for cursing them as well. I generally let the candles burn all the way down, then after I break the wax and dispose of them separated from one another. Both options are acceptable, the latter group is chopping it to signify the ending and separation. Hi, JayDee. The black candle that I have is the one where the figures are back to back with a candle in the middle. The Breakup "Couple" candle, with the couple back to back, is one of my favorites. I have a WWII German bayonet that my father brought back as a souvenir (he was a decorated hero with a box of medals and three bullet holes in his back). Anyway, I dress and curse the blade and insert it, blade down between the couple as the candle burns, to cut them apart. Oh wow! Great idea! Thank you! So I use a Freezer Spell (put the Miss Cat quote) for a breakup between a couple in a jar filled it up with water and it's freezing in my freezer. 1) If the spell worked, and now I take the jar, defrost it, pour out the water, and burn the paper. Is there a chance for the person i froze and my lover to come together again? 2) How do I add a name to an existing jar? Can I add the name on a separate paper without any declarations? 3) I added a name to a jar I froze to freeze out a guy I like girlfriend, and the 2 people are still together (live together).... This was August 19, 2018. Is there a timeline as to when I can expect results or reasons for not seeing any action on them breaking up? IF you freeze the person out and I think you are using the petition from Miss Cat that includes all types of individuals? Leave some space in the container, water expands when it freezes no need to explode. 1. Yes if you dispose of the spell that way its possible they can come back. I would leave it in their for a long time, well after its needed use. When done I would toss it in running water to send that/those people away, running water represents moving away. You pouring out the water and drying then burning the petition signifies you are done with the work and wish it not to apply anymore. 3. God is the ultimate decider in these cases, breaking people up because you like their gf is not often justified in Gods eyes and it may not work. Often people pray a justification prayer such as, If I am justified lord may John and Jane Doe break up for his cheating and using her..etc. Freezer spells are not completely a break up spell either, putting someone on ice cools them down, makes them cold, freezes them in place. TO break them up you would want to use break up or separation products. I would also consider getting a reading to decide if this case is justified and worth putting your energy into it. 3.b. You should be seeing signs and movement. try another working. I had a quick question about the spell kit before I place my next order. I know it comes with goofer dust and dog/cat hair. I'm going to order the spell kit, but I was also originally going to order goofer dust and the hair anyway because they were ingredients in a couple vinegar jars I am going to make. Do you use all the goofer dust and hairs in this spell kit or are there some left over for other spell work? Lucky Mojo kits come with the full ingredients as though you purchased them separately. You would have enough to use in the kit and enough to use for future work. If I made a vinegar jar along with the lemon spell, plus hot foot close to a year ago & disposed of all properly ,could I still be getting results from the break up work even if they haven't split up yet? I have heard that they have been fighting a lot I disposed I threw my vinegar jar into a river which the couple most likely cross sometimes back in Dec last year & forgot about it. Could it still be working? As well as the rotting lemon spell I placed in a tree? Thanks! Yes, I think it's possible they could still be working. Nice job! I just but a breakup bottle can I use his sperm in that ??? So finally I got a personal concern of both couples (hair from their head or face). I have read a few links on rather lengthy steps to doing some Break-up spellwork, and I noticed with me, the longer the spell steps are, the likely the spell results don't work so well for me (I don't know, but I think it is my patience and then feel for success). So I was wondering if there was a quicker way to breaking up a justified ie) just burning candles with oil dressed on it) to break up a couple in a toxic relationship (not mine) - using their hair? Will burning 2 black couple candles and writing their names be enough? Is there something else I can do? I did put one of their names in a Freezer (did the Freeze spell), but they are still together and it seems to be progressing forward in a way, and still together. What can I do to break them up that is easy?